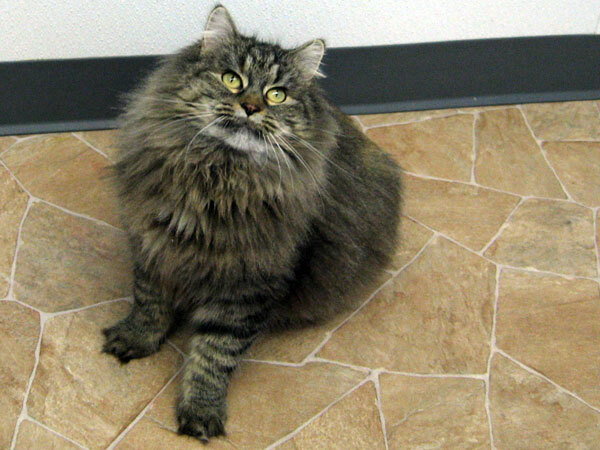 Forget Me Not Shelter Blog » Today’s featured cat: CACIQUE! Cacique came in as a stray with 5 kittens in tow back in July 2012; as so often happens, the kittens are all happily growing up in their adoptive homes, and Cacique is still waiting for someone to invite her into their family. We’ve given her a guesstimated birth date of March 2011. Cacique is friendly, happy, and playful. She is a medium haired tabby with just a touch of “torbie” (tortoiseshell/tabby) coloring. Unfortunately, during her very long stay at the shelter, Cacique has become quite overweight; we have her on a diet and exercise program, but she really needs a forever home to give her the attention she needs to fill that emptiness inside her… kitty kibble is a poor substitute for cuddles and love. Cacique gets along well with other cats once she gets to know them and they have worked out an arrangement – but she does NOT care for dogs! She will do well as an indoor or indoor-outdoor kitty, and should do fine in homes with children. She would also be a good single-pet, as she is playful but not super-hyper like kittens. She is a lap cat, and soaks up affection. See her full listing (including video) here!